During your Android development career, you may have to write apps that blur, sharpen, convert to grayscale, emboss, or otherwise process images. Even if your latest app isn’t necessarily focused on manipulating imagery, you can still employ interface design techniques such as blurring background content to focus the user on important alerts in the foreground, or using grayscale to provide contrast between available and unavailable options within the interface. To perform these operations quickly while remaining portable, your Android app must use Renderscript. This article focuses on embossing images via Renderscript. It first introduces you to the embossing algorithm, then it presents a Renderscript primer, and finally it shows you how to build a simple app that embosses an image in a Renderscript context. Books written in Braille, documents sealed with hot wax to guarantee their authenticity, and coins illustrate embossing, the act of raising content in relief from a surface. Embossing helps the blind read via the Braille system of raised dots, and it provides authentication for stamped, sealed documents or minted coins. (In the past, these seals guaranteed the weights and values of precious metals used in the coins.) Along with these real-world uses, embossing also lends a three-dimensional chiseled look to images. Figure 1 presents an example. 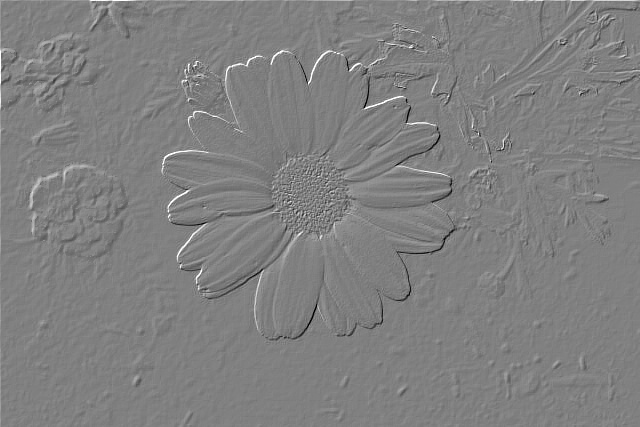 Figure 1: An embossed image also appears somewhat metallic. Think of an image as mountainous terrain. Each pixel represents an elevation: brighter pixels represent higher elevations. When an imaginary light source shines down on this terrain, the “uphills” that face the light source are lit, while the “downhills” that face away from the light source are shaded. An embossing algorithm captures this information. The algorithm scans an image in the direction that a light ray is moving. For example, if the light source is located to the image’s left, its light rays move from left to right, so the scan proceeds from left to right. During the scan, adjacent pixels (in the scan direction) are compared. The difference in intensities is represented by a specific level of gray (from black, fully shaded, to white, fully lit) within the destination image. Listing 1: This algorithm embosses an image in a left-to-right and top-to-bottom manner. Listing 1’s embossing pseudocode identifies the image to be embossed as src and identifies the image to store the results of the embossing as dst. These images are assumed to be rectangular buffers of RGB pixels (rectangular buffers of RGBA pixels where the alpha component is ignored could be accommodated as well). Because pixels in the topmost row don’t have neighbors above them, and because pixels in the leftmost column don’t have neighbors to their left, there is a bit of unevenness along the top and left edges of the embossed image, as shown in Figure 1. You can eliminate this unevenness by drawing a solid border around the image. After obtaining the red, green, and blue intensities for each of the current pixels and their respective upper-left neighbors, the pseudocode calculates the difference in each intensity. The upper-left neighbor’s intensities are subtracted from the current pixel’s intensities because the light ray is moving in an upper-left to lower-right direction. The pseudocode identifies the greatest difference (which might be negative) between the current pixel and its upper-left neighbor’s three intensity differences. That’s done to obtain the best possible “chiseled” look. The difference is then converted to a level of gray between 0 and 255, and that gray level is stored in the destination image at the same location as the current pixel in the source image. Renderscript combines a C99-based language with a pair of Low Level Virtual Machine (LLVM) compilers, and a runtime that provides access to graphics and compute engines. You can use Renderscript to write part of your app in native code to improve 3D graphics rendering and/or data processing performance, all while keeping your app portable and avoiding use of the tedious Java Native Interface. Note: Google introduced Renderscript in Android 2.0, but did not make an improved version publicly available until the Android 3.0 release. Because of subsequent developer feedback that favored working directly with OpenGL, Google deprecated the graphics engine portion of Renderscript starting with Android 4.1. Embossing and other image processing operations are performed with Renderscript’s compute engine. Although you could leverage Android’s GPU-accelerated (as of Android 3.0) 2D Canvas API to perform these 2D tasks, Renderscript lets you move beyond the Dalvik virtual machine, write faster native code, and run this code via multiple threads on available CPU cores (and GPU and DSP cores in the future). Renderscript declares a static RenderScript create(Context ctx) method that is passed a reference to your current activity, and that returns a reference to a Renderscript object. This object serves as a context that must be passed to other APIs. Allocation declares methods for wrapping data on the Java side and binding this data to the Renderscript runtime, so that the script can access the data. Methods are also available for copying script results back to the Java side. During the Android build process, LLVM’s front-end compiler compiles the script and creates a ScriptC_-prefixed class whose suffix is taken from the script file’s name. Your app instantiates this class and uses the resulting instance to initialize and invoke the script, and to retrieve script results. You don’t have to wait for script results because Renderscript takes care of this for you. A pair of #pragma directives must be specified and typically appear at the top of the file. One #pragma identifies the Renderscript version number (currently 1) to which the file conforms. The other #pragma identifies the Java package of the app to which the file associates. A pair of rs_allocation directives typically follow and identify the input and output allocations. The input allocation refers to the data that is to be processed (and which is wrapped by one Allocation instance), and the output allocation identifies where results are to be stored (and is wrapped by the other Allocation instance). An rs_script directive typically follows and identifies the ScriptC_-prefixed instance on the Java side, so that Renderscript can communicate results back to the script. Additional global variables can be declared that are either local to the script or bound to the Java code. For example, you could declare int width; and int height;, and pass an image’s width and height from your Java code (via calls to set_-prefixed methods on the ScriptC_-prefixed object) to these variables. A root() function typically follows that is executed on each CPU core for each element in the input allocation. A noargument init function typically follows that performs any necessary initialization and invokes one of the overloaded rsForEach() functions. This function is responsible for identifying the number of cores, creating threads that run on these cores, and more. Each thread invokes root(). You can place these items wherever you want in the file. However, rs_allocation-based, rs_script-based, and any other global variables must be declared before they are referenced. Now that you have a basic understanding of the embossing algorithm and Renderscript, let’s bring them together. This section first introduces you to the Java and C99 sides of an app (a single activity and an embossing script) that demonstrates embossing via Renderscript, and then shows you how to build this app. Listing 2: The embossing app’s activity communicates with the embossing script via script. The overriding void onCreate(Bundle bundle) method is responsible for setting up the activity’s user interface, which consists of a single android.widget.ImageView instance to which a click listener is registered. When the user clicks this view, either the embossed or the original version of this image is displayed, as determined by the current value of boolean variable original. Communication with the script occurs in the void drawEmbossed(ImageView iv, int imID) method. This method first obtains an android.graphics.Bitmap object containing the contents of the image to be embossed, and creates a Bitmap object containing an empty bitmap with the same dimensions and configuration as the other object’s bitmap. Next, a Renderscript context is obtained by executing RenderScript.create(this). The resulting Renderscript object is passed as the first argument to each of the two Allocation factory methods along with the ScriptC_emboss constructor. This context is analogous to the android.content.Context argument passed to widget constructors such as ImageView(Context context). static Allocation createFromBitmap(RenderScript rs, Bitmap b, Allocation.MipmapControl mips, int usage) creates an allocation that wraps a Bitmap instance with specific mipmap behavior and usage. bmIn is passed to b identifying the input Bitmap instance (containing the image) as the instance to be wrapped.Allocation.MipmapControl.MIPMAP_NONE is passed to mips, indicating that no mipmaps are used. Allocation.USAGE_SCRIPT is passed to usage, indicating that the allocation is bound to and accessed by the script. Allocation createTyped(RenderScript rs, Type type) creates an allocation for use by the script with the size specified by type and no mipmaps generated by default.allocIn.getType() is passed to type, indicating that the layout for the memory to be allocated is specified by the previously created input allocation. a reference to an android.content.res.Resources object (for accessing app resources). This reference is returned by invoking Context‘s Resources getResources() method. R.raw.emboss (the resource ID of the embossing script). At build time, the LLVM front-end compiler compiles the script into a file (with a .bc extension) containing portable bitcode that is stored in the APK under the res/raw hierarchy. At runtime, the LLVM back-end compiler extracts this file and compiles it into device-specific code (unless the file has been compiled and cached on the device). The LLVM front-end compiler generates a set_-prefixed method for each non-static variable that it finds in the script. Because the embossing script contains two rs_allocation directives (named in and out) and an rs_script directive (named script), set_in(), set_out(), and set_script() methods are generated and used to pass allocIn, allocOut, and script to the script. A script is executed by invoking an invoke_-prefixed method on an instance of the ScriptC_-prefixed class. The suffix for this method is taken from the name of the noargument init function (with a void return type) that appears in the script. In this case, that name is filter. Because Renderscript handles threading issues, allocOut.copyTo(bmOut); can be executed immediately after the invocation, to copy the script results to the output bitmap, and the resulting image is subsequently displayed via iv.setImageBitmap(bmOut);. Listing 3 presents the embossing script. Listing 3: The filter() function is the embossing script’s entry point. The script begins with a pair of #pragmas that identify 1 as the Renderscript version to which the script targets and ca.tutortutor.embossimage as the APK package. A pair of rs_allocation globals and an rs_script global follow, providing access to their Java counterparts (passed to the script via the previously mentioned set_-prefixed method calls). v_in contains the address of the current input allocation element being processed. v_out contains the address of the equivalent output allocation element. usrData contains the address of additional data that can be passed to this function. No additional data is required for embossing. x and y identify the zero-based location of the element passed to v_in. For a 1D allocation, no argument would be passed to y. For a bitmap, arguments are passed to both parameters. The root() function implements Listing 1’s embossing algorithm for the current input element, which is a 32-bit value denoting the element’s red, green, blue, and alpha components. This element is unpacked into a four-element vector of floating-point values (each between 0.0 and 1.0) via Renderscript’s float4 rsUnpackColor8888(uchar4 c) function. Next, Renderscript’s const void* rsGetElementAt(rs_allocation, uint32_t x, uint32_t y) function is called to return the element at the location passed to x and y. Specifically, the element to the northwest of the current element is obtained, and then unpacked into a four-element vector of floating-point values. Renderscript provides fabs(), fmax(), and fmin() functions that are equivalent to their Listing 1 algorithm counterparts. These functions are called in subsequent logic. Ultimately, Renderscript’s uchar4 rsPackColorTo8888(float r, float g, float b, float a) function is called to pack the embossed element components into a 32-bit value that is assigned to*v_out. Note: For a complete list of Renderscript functions, check out the online documentation or the .rsh files in your Android SDK installation. The script concludes with the void filter() function. The name is arbitrary and corresponds to the suffix attached to the ScriptC_-prefixed class’s invoke_-prefixed method. This function performs any needed initialization and executes the root() function on multiple cores, by calling one of Renderscript’s overloaded rsForEach() functions. In lieu of initialization, this function invokes one of Renderscript’s overloaded rsDebug() functions, which is useful for outputting information to the device log, to be accessed by invoking adb logcat at the command line, or from within Eclipse. In this case, rsDebug() is used to output the value of the RS_VERSION constant. This code fragment is an excerpt from Renderscript’s rs_core.rsh header file as viewed online. The filter() function invokes the appropriate rsForEach() function with the minimal number of arguments based on the current value of RS_VERSION, as revealed by this excerpt. Let’s build and run EmbossImage. For brevity, this section only shows you how to build and install this app’s APK in a command-line environment. Although it doesn’t also show the Eclipse equivalent, it isn’t difficult to extrapolate the instructions for the Eclipse environment. Windows 7 is the development platform. Change backslashes into forward slashes and remove the C: drive designator for a Linux environment. The project build directory is C:prjdev. Replace the C:prjdev occurrence with your preferred equivalent. Android SDK Revision 20 has been installed and an Android 4.1-based AVD associated with target ID 1 has been created. Execute android list targets to identify your equivalent target ID. Create the EmbossImage project by executing android create project -t 1 -p C:prjdevEmbossImage -a EmbossImage -k ca.tutortutor.embossimage. Replace the skeletal contents of EmbossImagesrccatutortutorembossimageEmbossImage.java with Listing 2. Introduce an emboss.rs file with Listing 3’s contents into the src directory. Create a drawable subdirectory of EmbossImageres. Copy the leopard.jpg file that’s included in this article’s code archive to this directory. With EmbossImage as the current directory, execute ant debug to build the app. Rexecute ant debug and the build should succeed. If successful, you should discover an EmbossImage-debug.apk file in the EmbossImagebin directory. You can install this APK onto your emulated or real device by executing adb install binEmbossImage-debug.apk. If installation succeeds, go to the app launcher screen and locate the generic icon for the EmbossImage APK. Click this icon and the app should launch. Figure 2 shows you what the initial screen should look like on the Android emulator with an Android 4.1 AVD. Figure 2: The activity displays an unembossed leopard at startup. 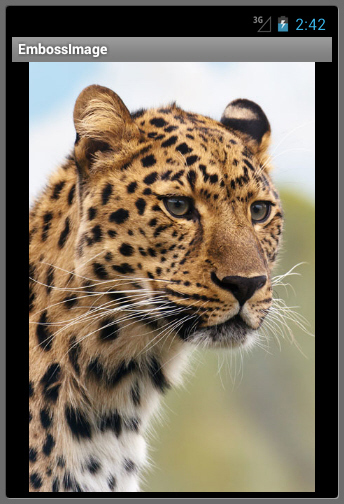 Click the leopard image (which is courtesy of Vera Kratochvil at PublicDomainPictures.net), and you should observe the embossed equivalent that’s shown in Figure 3. 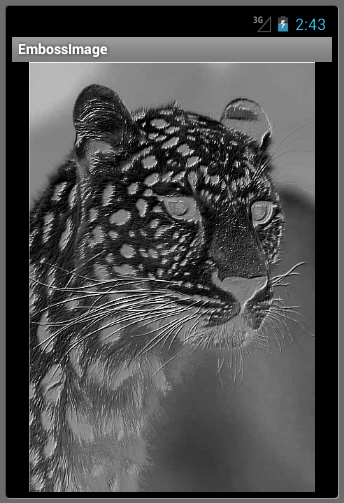 Figure 3: Clicking the activity causes an embossed leopard to emerge. Embossing and other image processing operations are fairly easy to write in Renderscript. As an exercise, enhance the embossing script to support the light source coming from a direction other than the northwest (such as the northeast). This technique can be invaluable for using color, contrast, and the inherent “elevation” of pixels to build intuitive interfaces and enable advanced image manipulation.